A foreign function interface (FFI) is a mechanism by which a program written in one programming language can call routines or make use of services written in another. builtin support from PyPy! Based on LuaJIT design. The goal is to call C code from Python without learning a 3rd language: existing alternatives require users to learn domain specific language (Cython, SWIG) or API (ctypes). The CFFI design requires users to know only C and Python, minimizing the extra bits of API that need to be learned. 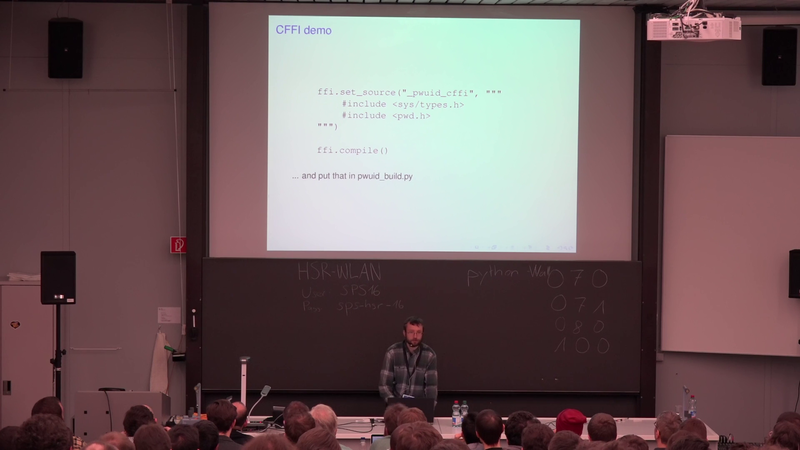 CPython: implemented in C, so quite easy?! 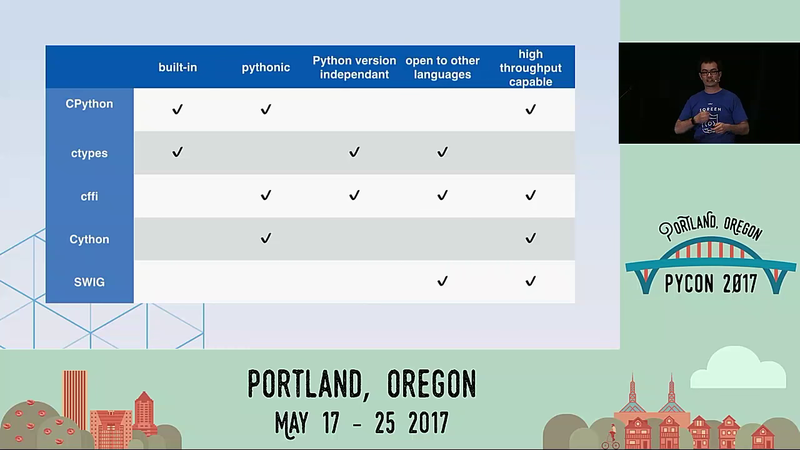 Just call Python functions you need - done?! Conclusion: Use extern keyword to avoid name mangling. C/Pascal has no function overloading. Some compilers do it anyways → use extern. Type system is irrelevant. In a library, there is no type system (only bytes, pointers and identifiers). If I create a Python object in C[++], will Python call its destructor? Will python find the library, I am linking in my C code? Can I run setup/teardown C code, before the Python runtime starts/terminates? Memory allocation / resource management is application-specific in C++: RAII, etc. Use API provided by #include <Python.h> for everything! drwxrwxr-x 1 meisterluk meisterluk   58 Jul 26 00:30 .
drwxr-xr-x 1 meisterluk meisterluk 2162 Jul 26 00:31 ..
# This file is compatible with both classic and new-style classes. // The .c file with the functions themselves. // A header file with function signatures for my functions. # The init file where everything is linked together. # Figure out the directories to everything. # This will be the name of the library file that gets compiled. # specified in the header files. This is necessary. # but I wrote nice wrappers in the .test module. # since it won't be generated directly from the headers. # Interfaces to the functions. # Alternatively one can call mycffi._lib.myfunc() directly. # and the header files. # import mycffi from the root directory. # point, so might as well facilitate it. or "license" for more information. This example does not call any C compiler. It works in the so-called ABI mode, which means that it will crash if you call some function or access some fields of a structure that was slightly misdeclared in the cdef(). You need a C compiler for this single step. It produces a file called e.g. _example.so or _example.pyd. If needed, it can be distributed in precompiled form like any other extension module. As Vladislav pointed out, they are different things. Thus they solve different problems. I would choose cffi when I just need to call a few C libraries. When I need performance or to fluidly interact with C code, I would choose Cython. By giving hints to the language it can take optimal paths for the limited scope you are describing. Just a few hints can give you tremendous performance gains. To be honest, I would probably just use Cython for both, but that is preference.